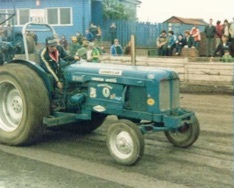 “It really was the start of tractor pulling for me - we raised good money for charity, everybody had a lot of fun doing the event and we even took part with one of our farm tractors, an old Massey Ferguson 590,” explains Peter Clarke. After which, it wasn't long before the first pulling tractor emerged from the Windbush Farm workshop. From here, Clarke was determined to maintain his competitive edge with pullers all over Europe. To do so, he needed more power. 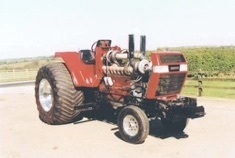 And the Windbush tractor - a Ford 5000 with a six-cylinder engine and two turbos – provided that power. “We needed more boost and this was our first effort at two-stage turbocharging,” he recalls. Not satisfied with the performance of a two-stage turbo set-up, Clarke gave the Windbush a facelift with sheet metalwork from a Ford 7910 and renamed the tractor Bull Power. Turbocharging stepped up to a three-stage system. 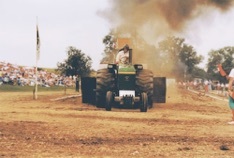 And around the same time, Clarke had seen a visiting American super stock tractor competing in Europe – this was a John Deere 4430 owned by Ron Johnson and called Bits 'n' Pieces. 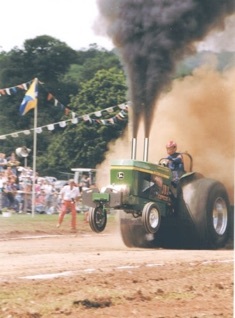 Impressed by its performance, he bought the Deere to replace his triple-turbo Ford, which was exported to Sweden. Called the Running Deere, this triple-turbo John Deere with its 466 cubic inch engine, put Clarke back on Championship winning form. In 1988, he won the 3.4t European Championship in France. With a high-calibre super stock and lots more knowledge, he decided to enter the prostock class with a 4230 John Deere supplied by local dealer JBJ Machines. 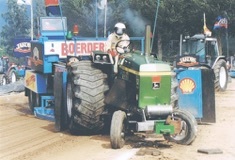 This was eventually to become the JBJ Express – a four-turbo diesel superstock – that was the first tractor to win a 3.4t Eurocup series title in 1993. In 1994, the JBJ was runner-up, then third in the series through 1995. But the mixed fortunes with the two Deeres ended in 1995. To get back on top, a change of direction was needed, and Clarke changed colour, in favour of IH equipment and the knowledge available from US engineering firm, Hypermax. 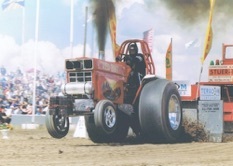 After the EC's at Horby in 1995, Clarke reached a turning point in tractor pulling - to get back on top he decided that the straight-through driveline of the IH tractors from crank to differential, would offer an advantage. But it had to be good. The move to red would need serious performance, something that could blow the opposition clean off the track. 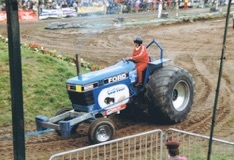 Arch rival Willem Veldhuizen was already experimenting with his alcohol-fuelled Deere called Bits n Pieces, and was running very well and proving hard to beat. That four-turbo machine was Red Alert, which put the team back on the map during 1996 and 1997 – giving the team a strangle-hold in the 1996 Eurocup series that went all the way to the last event, battling Bits n Pieces all the way. Only an out-of-bounds run ended the team’s championship hopes in the last round. “It was a wake-up call to the rest of the super stocks, but it really shocked Willem,” recalls Peter. 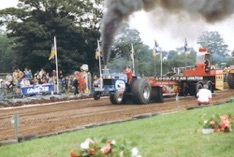 And in 1997, Red Alert took the win in the heavyweight 4.5 tonne super stock class. 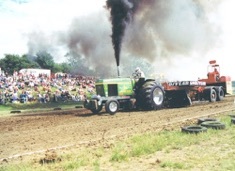 But as the Dutchman’s alcohol tractor started to show its advantages, the diesel engine’s reliability suffered. And in 1997, after being runner-up to Esdon Lehn’s awesome Red Line Fever in Ahoy, the team finally bit the bullet and switched to alcohol. It was a decision that was to have a positive impact on the team’s competitiveness, notching up many successive wins and championship titles. Eurocup Series again, while in 2003, the team finished the Eurocup series in the runner-up spot. 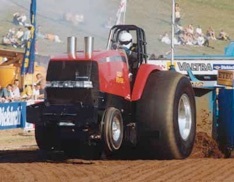 In 2004, the rule book’s amendment that allowed the introduction of component chassis tractors to the class – but Peter Clarke was ready, having spent 2003 building Red Fever in the farm workshop, using the chassis and rear-end from former 2.4t modified champion Limited Edition. 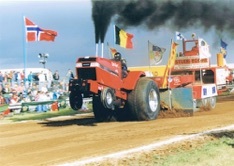 As two of the most competitive alcohol super stock tractors in Europe, Red Alert and Red Fever continue to compete in the UK and at European events. And 2008 should be an exciting season for the team. 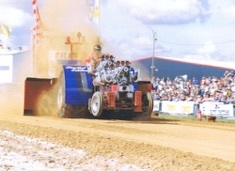 No fewer than 11 tractors have passed through the Clarke Pulling Team’s hands in its current 30-year history. 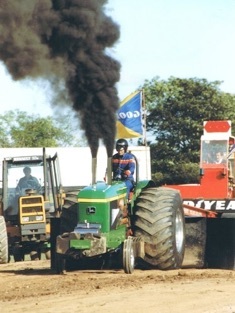 There have been others, including two chassis – one of which has been turned into successful alky super stock Just Smoky, by Warwickshire farmer David Jones.